Canute Road Quay will be making an appearance at The Model Railway Club’s open day / mini exhibition next Sunday 10th December at their London Keen House club rooms. USA 0-6-0t No 72 still with original style bunker and cab shunts past a warwell wagon loaed with a Sherman M4 tank at Canute Road Quay. The Model Railway Club’s own Layouts: Copenhagen Fields (2mm FS), Empire Mills (EM), Lacey Dale (N) and Putnam Yard (HO) will be operating. In addition to Canute Road Quay a couple more visiting layouts will be in attendance namely: Rixworth Green (P4) – 1920s Southern and Elkington-on-Sea Tramways – inpsired by the 1950s British seaside resorts. Other displays include the MRC’s 00 and 0 gauge teams running stock from their layout projects on the test tracks. There will also be a selection of pre-owned models available from The MRC shop, and of course refreshments (including a selection of freshly made rolls and Greene King beers) will be available. The min exhibition with be open from 11am to 4pm, admission is Adults £3, accompanied children: Free. Entry for MRC members is free upon presentation of a current membership card. Please note: there are stairs to all rooms. Following a very pleasant afternoon spent with friend, inspirational modeller and one of the very best model rail photographers, Chris Nevard back in September, the results of his efforts an article on my little shunting layout Canute Road Quay can be seen and read about in the December edition of Model Rail Magazine, issue 242, published today (although subscribers should have received their copy earlier this week). As the inspiration for the layout was mainly due to the release of the Model Rail commissioned USA tanks, for which I provided their team with a small amount of assistance, it was therefore only right that first published article about the layout was in Model Rail Magazine. As a slight departure from other model railway publications the article is in fact written by the Model Rail in-house staff writer Mike Harris, following a telephone interview rather than the layout builders own words. One of Chris Nevard’s excellent pictures captures both a USA and B4 on Canute Road Quay. Picture courtesy and copyright C Nevard/ Model Rail. I did however provide some written text before the interview to ensure that much of the content that I wanted to be included got suitably covered. I have therefore tried to ensure that information such as Tim Horn’s excellent baseboards, the LCut Creative laser cuts building components and how I created the inset track work and other details have been duly included within the article. My kit built ex LSWR Adams B4 brings loco coal towards the small sub shed at the quay. Picture courtesy and copyright C Nevard / Model Rail. Although a small layout (only 4ft x 1ft) Chris as ever has managed to find and capture a few new angles with his cameras and many of the little cameos I have included on the layout were duly snapped. I hope that you can get hold of a copy and enjoy the read and Chris’s excellent photographs. Canute Road Quay will also be making an appearance at The Model Railway Club’s open day / mini exhibition on Sunday 10th December at their London Keen House club rooms. I am not actually a member of the The Model Railway Club so I feel it has been a great honour to have been asked to take Canute Road Quay along and I am very much looking forward to visiting Keen House and exhibiting Canute Road Quay. 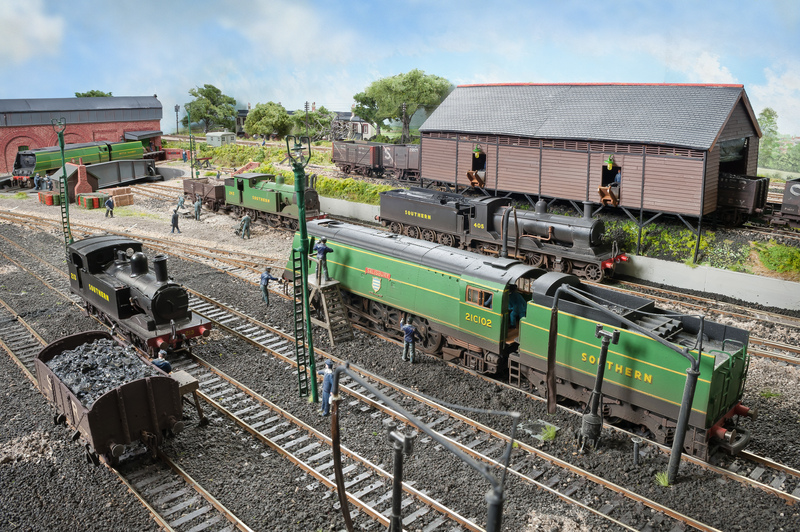 I am pleased to announce that Fisherton Sarum will be appearing at the London Festival of Model Railways at Alexandra Palace over the weekend of 28th and 29th March 2015 , this follows on from my post here last month advising of the two then booked appearances for Fisherton Sarum next year. The London Festival of Model Railways is organised by Warners (as per the Peterborough and Doncaster shows) in association with The Model Railway Club. It is held in the historic venue of Alexandra Palace, N22 7AY . Fisherton Sarum will be one of 40 or so layouts attending along with the usual wide mix of traders. I hope you get the chance to see Fisherton Sarum at one of the shows in 2015, if you do please make sure you say hello.